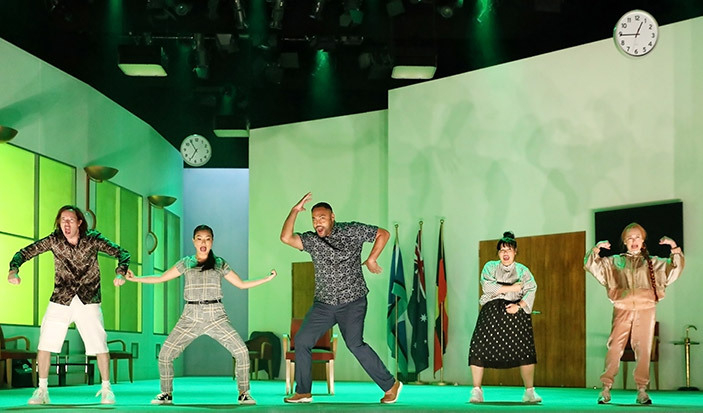 Gareth Davies, Michelle Lim Davison, Anthony Taufa, Nakkiah Lui and Vanessa Downing on stage during one of How to Rule the World's theme tunes, 'The Perfect Man'. Which sound design moment gives Paul Mac chills? Is drama or comedy harder to compose for? We spoke to chart-topping electronic music producer Paul Mac and the celebrated and prolific theatre composer and sound designer Steve Francis about creating the soundtrack for Nakkiah Lui’s biting political satire, How to Rule the World – a production as technically vibrant as it is rich in theme and purpose. Find out how a legend of Australian dance music found himself composing for theatre, gain an insight into theatrical sound design from one of the best in the field, and hear the music that resulted when the two got together in the studio for Sydney Theatre Company’s How to Rule the World. Download episode and subscribe to our podcasts via Apple Podcasts. How to Rule the World, 11 Feb – 30 Mar 2019, Drama Theatre, Sydney Opera House.